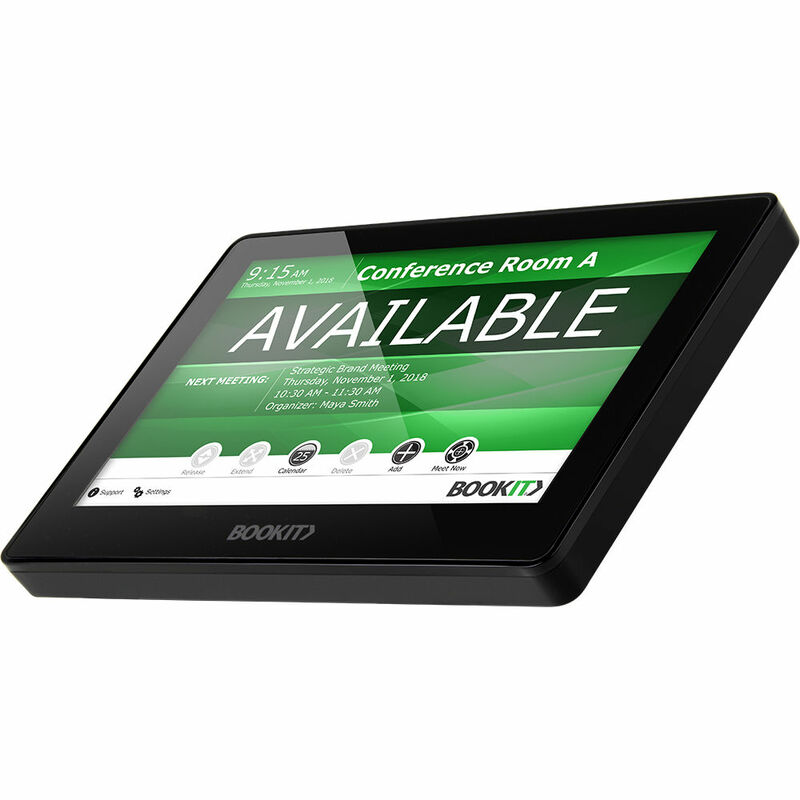 Simplify your company's conference room scheduling with the BookIT BOOKIT07A Room Scheduling System. The included 7" IPS LCD touchscreen display shows the status of rooms with color-coding and can be used to reserve rooms and manage meeting times. The display runs on Android 4.4.4 and connects to your network via integrated Wi-Fi or Ethernet. An onboard HDMI output lets you simultaneously show a room's status on a larger display. You can mount the display to the wall outside a conference room with the included wall surface mount, and other mount options are available separately. Clicking on the calendar lets you see meeting details for any room in the Calendar and Add Event screens. The list is scrollable, so you can see up to the end of the booking period allowed in Exchange or Google. Color-coded room statuses of red, gold, and green quickly let you know the availability of a room. Select "Add," then enter your credentials, and you can schedule a meeting in any available room for any available time. This function allows booking of a room without logging in. Events are entered in the room calendar, only so the room is seen as occupied. This is suitable for impromptu meetings. Show that a room is booked without displaying the subject or attendees. If nobody checks into the room within the configured amount of time, the room will automatically release for others to use. This feature can be enabled, disabled, or configured at any time by the administrator. If your meeting ends early, you can make the room available for others by releasing the room on the BookIT display panel, updating the room status and the end time of your meeting automatically. Only meetings in-session can be released via the display. You can extend your current meeting time as long as you need based on the room's availability. Meetings in-session can be deleted via your phone, computer, or the BookIT display by the meeting organizer. This function lets you see the closest available room through the BookIT panel, in case your first choice of room is occupied. Reporting features help ensure that your rooms are being fully utilized. If you're having a technical issue with some of the room's hardware, touch the "Support" option to send a predefined message to summon your internal tech support team to the room. Box Dimensions (LxWxH) 10.6 x 5.2 x 2.3"